But as some observers noted, it was odd that in both cases, neither of the employees identified the business when they picked up the phone. And Axios noted there wasn’t any recognizable ambient sound you would expect, like the buzz of a hair dryer or the clatter of plates. It’s totally possible that what we heard on stage was simply edited for one of many legitimate reasons, but many people have been lamenting the fact that Google may have stood on stage and said something was real when in fact it maybe wasn’t. But it’s a great (and important!) reminder that you should never trust a tech demo, on stage or otherwise. The Duplex demo everyone is talking about. Just to be clear: Tech demos are almost never real. Sure Microsoft or Apple might plug in a phone or computer and mirror it to a huge screen to show you what’s actually really happening on the devices. And there are many notable examples of times when these demonstrations haven’t gone as planned in the hands of giants like Bill Gates and Craig Federighi. But even in the most realistic demos, everything has been repeatedly rehearsed and optimized to show exactly what a company wants you to see, taking dramatic license as needed and fudging things so the demonstration is smooth, efficient, and timely. The on-stage tech demo is a big part of the public relations machine these companies engage in. PR and marketing people are less concerned with accuracy than they are in producing a demo that will generate the most generous impression from the audience and critics. For the teams producing these demos, it’s about selling the product, and as you know from commercials, selling a product doesn’t mean portraying products as they actually are. Think back to the story of the first Apple Macintosh launch, conducted by Steve Jobs, who basically invented the onstage tech demo as we know it today. Dramatization of an early tech demo lie. The movie Steve Jobs dramatizes this famous fakery. The scene is set in the frantic moments just before Jobs presents the original Macintosh to the world in 1984. The Macintosh 128K can’t say “hello” as Jobs demands, so Apple engineer Andy Hertzfeld suggests using a more powerful 512K, which would not be available until later in 1984. And it’s what actually happened. “We decided to cheat a little,” the real Hertzfeld confirmed on his site Folklore. They really did switch out the machine so the demo would work. The on-stage demonstration Apple pioneered has since produced all manner of theatrics, some brilliant and some ham-handed, and all in their own ways not exactly real. Microsoft’s recent “workplace” demos at its Build developer conference are very clearly a dramatization. Last year a man, hard hat at a cocky angle, strode across stage and pretended to use construction equipment wrong to show how Microsoft’s AI could identify and tag unsafe practices on a worksite. It was so garishly theatrical I don’t think anyone genuinely thought it was real. And I would like to meet the person that believed Apple’s Phil Schiller when he played music over the sound system at McEnery Convention Center in San Jose last WWDC and told people that was what the HomePod would sound like. Apple’s HomePod demo at WWDC 2017. That was a really cool demo! Sadly, Google Glass never even began to approach the functionality displayed there, or else it might have actually gone mainstream. But the video on YouTube, as with all other demos, was a dramatization intended to illustrate. 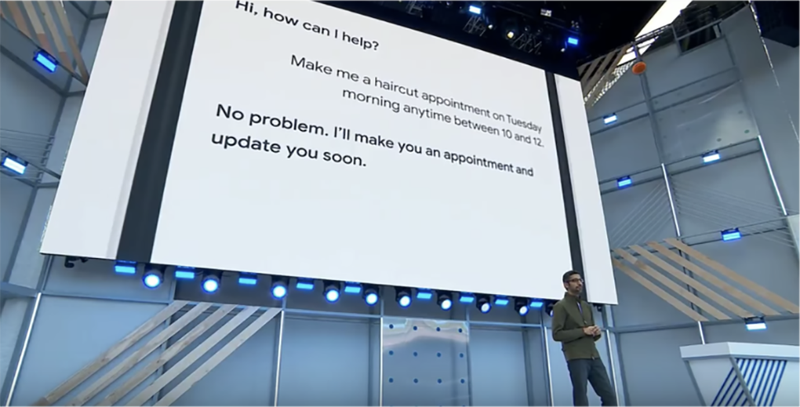 The only real difference between all of these and the Duplex demo is that Pichai specifically said it was real while he was up on stage, and Google has since failed to prove it despite repeated requests for comment. The plot continues to thicken. After Daring Fireball’s John Gruber asked readers to help him find the restaurant featured in a Duplex demo posted to Google’s AI blog (they found it almost immediately), Mashable went and called the place. A man at the restaurant first said Google’s AI did place a reservation, then, according to Mashable, the person on the phone “appeared to be nervous” and ended the call without reaffirming Google had contacted the restaurant. Weird! Suspicious! And if it didn’t happen, if it is all a lie, well then I’ll be totally disappointed. But I can’t say I’ll be surprised.